I knew we had a winning recipe on our hands when everyone who took a bite immediately asked us for this recipe. Tuscan Kale with Garlic Tomatoes is bursting with flavor from pan-roasted garlic and sweet grape tomatoes. Our menu of oven roasted chicken, quiche (two kinds – see here and here), and roasted potatoes needed a green, leafy vegetable to round things out. We had a head of Tuscan kale in the refrigerator, plus a large container of grape tomatoes on hand – and some heads of garlic on the counter – I made this fantastic Tuscan Kale with Garlic Tomatoes. 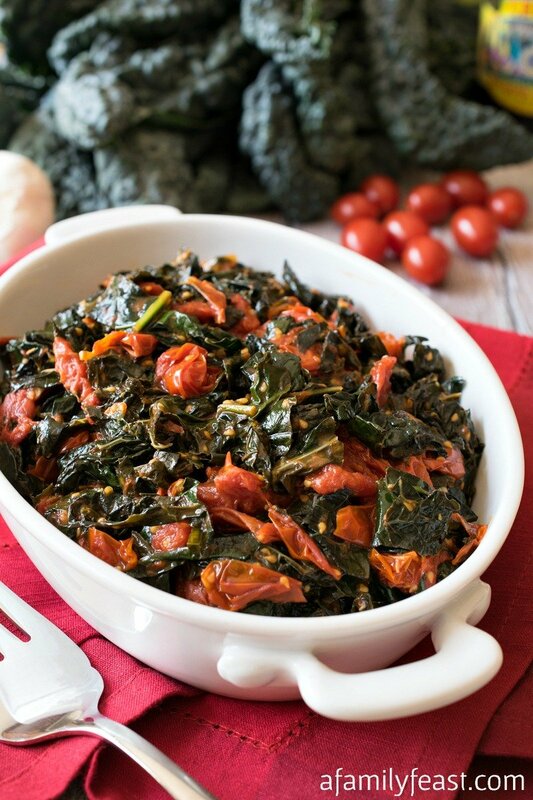 How do you make Tuscan Kale with Garlic Tomatoes? This easy recipe harkens back to a similar cooking technique that we originally shared here – where peeled, whole cloves of garlic are pan-roasted in extra virgin olive oil over very low heat, so the outside of the garlic turns a golden brown, while the inside becomes soft and the garlic flavor mellows. Once the garlic is golden, I add the grape tomatoes to the pan and cooked them until the skins puckered and burst open – creating a fantastic, super flavorful garlic tomato sauce. At this point, cleaned and trimmed Tuscan kale is added to the pan and cooked covered until tender – tossing the leafy greens with the garlic tomato sauce. Finally, a couple of tablespoons of balsamic vinegar is drizzled over the kale, and after one final toss – your Tuscan Kale with Garlic Tomatoes is ready to serve. I really should have made a double batch – this Tuscan Kale with Garlic Tomatoes was devoured quickly. And, it was so good, my husband Jack told me that he woke up the next morning thinking about it! To clean the Tuscan kale, grab the leaves with your fingers on the thick end of each stem and pull down, ripping all of the leaves from the stem. Once you get the hang of this, you can go pretty fast removing the leaves. Discard stems. Lay the leaves out and cut across the grain then a few slices down the center to yield bite-sized pieces. Place in a salad spinner and rinse thoroughly, then spin to remove most of the water. Some water still clinging to leaves is fine and helps in cooking. In a large sauté pan or skillet, heat oil over medium heat until hot then lower flame to medium low and add the garlic. Cook the garlic for about five minutes until golden brown on the outside and soft on the inside, flipping to cook all sides. Add the tomatoes and continue to cook for 5-7 minutes until they blister and start to burst. Use the back of a wooden spoon and flatten and break up the garlic, as well and crushing about half of the tomatoes. Add the kale and toss, then cook for five minutes covered. Remove the cover and cook for up to five more minutes until tender and any liquid has evaporated. Sprinkle on the vinegar, toss then serve immediately. You are very welcome Janice! We love your additions to the recipe!